NEW YORK (AP) For more than 50 years, the New York Mets chased that elusive no-hitter. 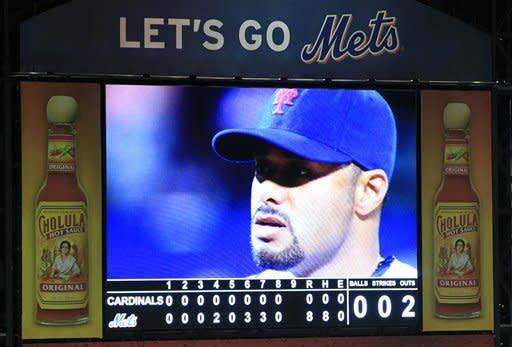 Johan Santana finally finished the job. Santana pitched the first no-hitter in team history, helped by an umpire's missed call and an outstanding catch in left field in an 8-0 victory over the St. Louis Cardinals on Friday night. 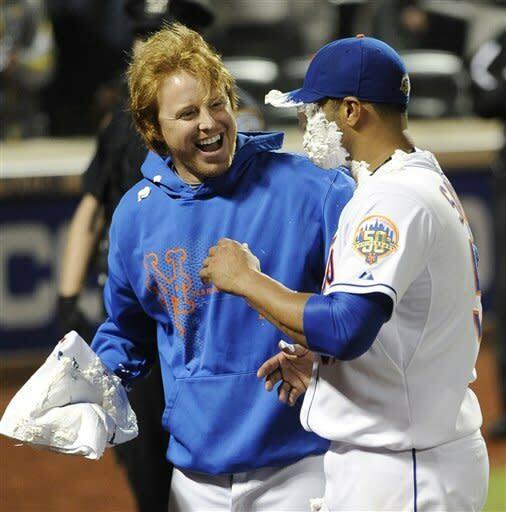 After a string of close calls over the last five decades, Santana went all the way in the Mets' 8,020th game. He needed a couple of key assists to pull it off. Carlos Beltran, back at Citi Field for the first time since the Mets traded him last July, hit a line drive over third base in the sixth inning that hit the foul line and should have been called fair. But third base umpire Adrian Johnson ruled it foul and the no-hitter was intact - even though a replay clearly showed a mark where the ball landed on the chalk line. ''I saw the ball hitting outside the line, just foul,'' Johnson told a pool reporter. The umpire acknowledged that he saw the replay afterward but declined to comment. Hometown kid Mike Baxter then made a tremendous catch in left field to rob Yadier Molina of extra bases in the seventh. Baxter crashed into the wall, injured his shoulder and left the game. Making his 11th start since missing last season following shoulder surgery, Santana (3-2) threw a career-high 134 pitches in his second consecutive shutout. Relying on a sneaky fastball and the baffling changeup that's always been his signature, he struck out eight and walked five with wind gusting up to 30 mph. Before the game, Mets manager Terry Collins said he planned to limit Santana to 110-115 pitches all season. ''I just couldn't take him out,'' a choked-up Collins said afterward. Born in 1962, the Mets have been built on pitching when they've fielded their best teams. But neither Nolan Ryan, Tom Seaver nor Dwight Gooden could throw a no-hitter for the Mets - though all three are among the seven pitchers who tossed one after leaving the team. Philip Humber is another one. He pitched a perfect game for the Chicago White Sox at Seattle on April 21, and Jered Weaver of the Los Angeles Angels no-hit Minnesota on May 2. ''What pride! Long live Venezuela!'' Chavez said in the message. Santana got a warm ovation as he headed out to the mound for the ninth inning, and the two-time Cy Young Award winner quickly retired Matt Holliday and Allen Craig on shallow fly balls as frenzied fans high-fived each other and captured video of it all on their cell phones. With the crowd of 27,069 on its feet, World Series MVP David Freese went to a 3-2 count before his foul tip was caught by Josh Thole, just activated from the disabled list earlier in the day. Santana pumped his left fist, slammed it into his glove and shouted as Thole showed the ball to plate umpire Gary Cederstrom and then went running out toward the mound. The Cardinals, the top-hitting team in the NL this season, should have had a hit in the sixth. Beltran, traded by the Mets to San Francisco last July after 6 1/2 rocky seasons in New York, led off with a low liner over third. Television replays showed the ball nicked the foul line just behind the bag on the dirt, taking a small chunk of chalk with it. But Johnson called it foul immediately and Beltran eventually grounded out. But with the next batter at the plate, Cardinals third base coach Jose Oquendo twice got in Johnson's face for heated arguments - the two even appeared to bump each other. Rookie manager Mike Matheny also came out to protest, but nobody was ejected. ''It's not like there's going to be an asterisk by it. That's the way the game goes,'' Matheny said. Almost exactly two years ago - on June 2, 2010 - Armando Galarraga lost a perfect game when first base umpire Jim Joyce admittedly blew a call that should've resulted in the final out. The miss in Detroit instead gave Cleveland's Jason Donald a single with two outs in the ninth. Major League Baseball had considered expanding replay for this season to review fair-or-foul calls and trapped balls. The change required the approval of MLB and the unions representing the umpires and the players - when there was no agreement, extra replay was postponed until at least 2013. Santana cruised from there into the seventh, when Molina hit a one-out drive to deep left. Baxter, who grew up rooting for the Mets only 10 minutes from where Citi Field stands, raced back and made a terrific catch before crashing full force into the fence. Baxter stayed down on the warning track as Mets trainers, players and coaches rushed out to him. Santana crouched in the infield with a couple of teammates and then made a few warmup tosses to stay loose. Baxter walked off the field under his own power, with trainer Ray Ramirez holding the outfielder's left arm because Baxter had no feeling in it. The Mets said Baxter has a bruised left shoulder and was having more tests. ''I'm glad I had a chance to be part of it. It's a great night for the Mets,'' Baxter said. Lucas Duda hit a three-run homer off Adam Wainwright (4-6) and drove in four runs, tying a career high. Daniel Murphy added three RBIs. The San Diego Padres, who started play in 1969, are now the only team without a no-hitter. The Mets' seemingly endless pursuit had become something of a famous quest, with at least one website dedicated to counting off their total number of games without a no-hitter each day during the season. Radio announcer Howie Rose often did the same when the opposing team got its first hit. The list of pitchers who have thrown no-hitters after leaving the Mets includes Ryan and Seaver, both Hall of Famers, plus Gooden, David Cone, Mike Scott, Hideo Nomo and Humber. Ryan, in fact, pitched a record seven no-hitters. Now the president of the AL champion Texas Rangers, he's still aware of the Mets' no-hit history - or lack thereof. Seaver came within two outs of a perfect game in 1969 and fell one out shy of a no-hitter in 1975, the previous time a Mets pitcher had made it into the ninth without yielding a hit. NOTES: Santana's previous career high was 125 pitches. ... It was the eighth no-hitter pitched against St. Louis and the first since Fernando Valenzuela for the Los Angeles on June 29, 1990. ... Mets 3B David Wright said in a radio interview on WFAN that he won't talk to the team about a new contract until after the season because he doesn't want his situation to be a distraction for the team. Wright's salary is $15 million this season and New York holds a $16 million option for 2013, which gets voided if he is traded. After that, he can become a free agent. ... Replays showed Cardinals pinch-hitter Shane Robinson was hit on the hand by a pitch in the eighth. He started toward first, but Cederstrom called it a ball.